The PS4 may be just around the corner, but the PS9 is creeping over the horizon. 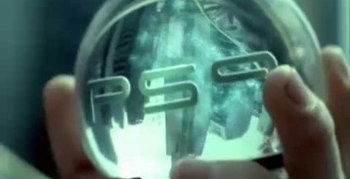 Yesterday, Sony teased what could be our first glimpse of the next PlayStation console. Sure, the company's newly announced PlayStation Meeting 2013 event is still a few weeks away, but if we're going to peer into the future, why not go all out? Way back in the early 2000s, just when the PlayStation 2 was hitting its stride, Sony offered a preview of what gaming will be like in the year 2078 with the PlayStation 9. Yes, it was just a marketing ploy to drum up further excitement for the PS2, but it was one of the most unique video gaming console advertisements ever. I mean, who would ever think to showcase a device that doesn't even exist in order to get people excited for a real world product? Featuring electronic spores, retinal scanning, and a mind-control system, the PlayStation 9 is everything you could ever want from a game console. The only downside, of course, is that it doesn't actually exist... yet. If you never got a chance to view the ad in its original run (and even if you did), take this opportunity to go back to the future. If the PS9 ad doesn't tickle your fancy, feel free to sound off on what you think is the best game console ad of all time. Just, please, no creepy babies.